The Metropolitan Branch of the Baltimore and Ohio Railroad was completed in 1873, providing a direct route from Washington to the West and connecting at Point of Rocks with the B&O’s old “Main Stem.” The Metropolitan almost overnight became the railroad’s main passenger and freight line. Nearly half a century separated the start of the B&O Main Stem in1828 and the opening of the Metropolitan Branch. Until then all traffic from Washington to the west had to move via Baltimore and Frederick, more than double the distance of the Metropolitan Branch. Besides being inconvenient, this created economic hardships for the areas by-passed. By the 1840’s, as rail technology improved, the railroad had captured so much of the western trade for Baltimore that Georgetown, Rockville, Frederick and other towns on the old National Pike feared economic ruin. The Metropolitan route was therefore proposed by Montgomery County and Georgetown businessmen in the 1850’s. Bickering among its sponsors and determined opposition by Baltimore interests delayed the execution until after the Civil War, which had made manifest the strategic necessity of such a link between Washington and the west. 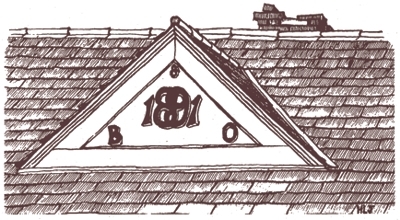 It was finally undertaken by the B&O in 1866. Even then, there were long delays and adjustments of the route to meet the interests of influential landowners. At first, construction moved slowly, delayed by right-of-way negotiations and difficult cuts that had to be made through solid rock. After 1870, work crews were beefed up and the last rail was laid at Gaithersburg on February 8, 1873. Regular service began on May 25, 1873. Unlike some achievements of 19th century industrial technology, the 41-mile Metropolitan Branch preserves many of its best features: culverts, viaducts, platforms, sidings and depots – and still has valuable lessons in the development of signaling, switching and other railroad operations. Equally visible is the railroad’s lasting effect on the growth of Montgomery County, and on “upcounty” social life and farming patterns. 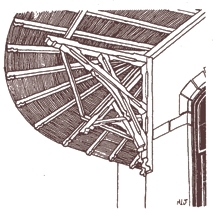 In its heyday, it attracted mills, dairy farms, stores, and small towns, several of which were moved from sites farther away. Summer resorts and camp-meeting grounds developed. Fresh milk, sped to Washington on the morning “milk train,” led to the growth of the local dairy industry. As you travel the Metropolitan Branch between Rockville and Brunswick, notice how past and present intermingle along the line. Old mills, barns and warehouses reveal the area’s agricultural roots, and the railroad’s weathered stations and lamp posts chronicle its own waning influence after the coming of automobiles and hard roads in the 1920’s. Alongside these, and today’s mechanized farming operations, is the infrastructure of modern suburbia, with its expressways, subdivisions, gas stations and commercial strips. A delightful excursion may be planned for a Friday afternoon. It must be Friday because the train described runs only on Friday. It starts at 1:45 at Union Station. (See schedule) Beautiful weather is a must. Arriving at the MARC parking lot on Park Street off Middle Lane in Rockville, the traveler is met with an imposing cement wall with a small sign reading MARC and an arrow directing one to a plain black metal door. Beside the door is a button reading “Trains.” Press the button and the black door opens to an elevator with two buttons reading “Train” and “Street.” Touch “Train” and be instantly whisked to the fifth level where the door opens onto tracks. Join the cue to board. Inform the conductor that you will buy your ticket onboard. There is a ticket station on the street level, but no one is there to sell tickets. There are electronic machines inside the Metro section, but it’s much easier to buy onboard. Regular fare is $6 one way, $12 round trip. Seniors pay $3 and $6. Children six and over pay full fare; youngsters five and under ride free when accompanied by an adult. 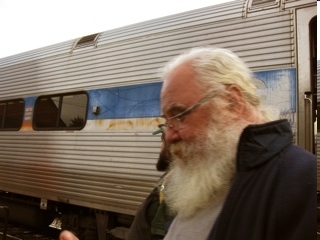 Call 1-800-325-RAIL to check on current trains and fares before leaving home. On Friday only, Train 871 arrives in Rockville at 2:12. Try to get a seat on the right hand side. 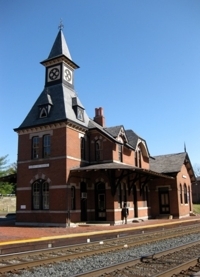 Montgomery County seat and former market town, whose handsome brick depot, finished in 1873, was the first station built “upcounty.” The short 45 minute run to Washington (fare 60¢ in 1873) made Rockville a popular summer resort and commuter town, and stimulated local business. Until the late 19th century when the Wire Hardware and Lumber Company moved in, the building behind the station housed a general merchandise store that had started in a shed near the tracks. This is the first stop beyond Rockville, started by a group of Washington Methodists who bought land as part of an organized camp meeting community. These camp meetings continued for fifty years and drew crowds of up to 10,000 persons. The town has become a small residential community, whose large common and long, rectangular lots suggest the former tent sites. Washington Grove has an attractive passenger waiting area of Victorian design. The railroad emancipated milling from water power and caused steam powered mills to be built at stations along the right of way. 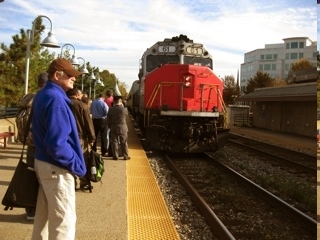 Gaithersburg was one of the first to be developed and the agricultural supply functions of the town are still rail-oriented. East of the railroad, between Washington Grove and Gaithersburg, are three mills built in the 1920’s and 1930’s to take advantage of rail shipment. The first, Wayne Feed and Supply, was and has a new use, the last operating mill in Montgomery County. It survives near an urbanizing area by custom-mixing horse and cattle feeds, and supplying specialty feeds for pets and laboratory animals. The next, Williams Feed and supply, stopped milling feed from wholesalers to supply government installations and the Washington Zoo in 1970, and now markets garden supplies. The old Bowman Mill, in downtown Gaithersburg, has been converted to upscale shops and office space. On your left in the town center is a large, brick parking garage. New uses have been delegated for the former mills. This is an expanding “corridor city,” linked to Washington, Frederick, and nearby Federal installations by I-270. The brick B&O Station dates from 1884 with additions in 1905-1907, when much of the line was modernized. Double track was laid, curves and grades eased, and strong new bridges built. As the train leaves Gaithersburg it passes (on the right) a former canning factory, marked by a brick chimney, and the Montgomery County Fairgrounds. The former cannery, which processed peas, corn and green beans, now has new mixed commercial uses. Further on the left are the extensive grounds and laboratories of the National Institute of Science & Technology (just south and west of I-270). This is an impressive three arch stone bridge, built in 1906 to carry the roadbed over Great Seneca Creek. Until then trains crossed on a high and dangerous looking wooden trestle. 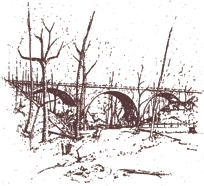 The 350 foot viaduct was built in the course of straightening and double-tracking the line between Gaithersburg and Germantown. It stands 70 feet above the stream valley. Look sharp to see the creek, down and to the right, 3.3 miles past Gaithersburg. The original settlement was a mile south of the tracks, but the commercial center of the town soon moved to a site along the new railroad. 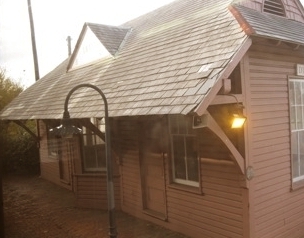 At Germantown, the B&O had planned a two-story brick station but built a small wooden station in 1891, replaced with an exact replica in 1989. The protruding bay, on this and other stations, housed the station master’s office with its clacking telegraph, giving him a vantage point to see up and down the track. The new station is complete with brick paving, new lighting fixtures, large parking lots and added train service. The bank building is now used by the Germantown Historical Society. A very large grain mill, built by Bowman Brothers, stood directly adjacent to the tracks. Having burned in 1972, the original foundation may be seen on the south side of the tracks. 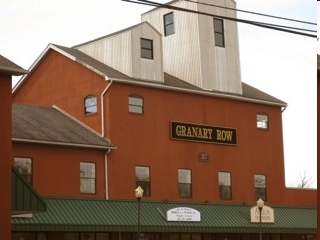 Germantown, a rural village until 1980, has a population of over 100,000 in 2010 and has plans to expand. From Germantown to Barnesville, about six miles west, deep cuts through the rocky hills and ridges were excavated by work crews under James A. Boyd. Boyds is named for James A. Boyd, successful public works and railroad contractor. The town grew around the railroad. Boyd purchased nearby farms to encamp his workmen, and soon after the construction was finished, settled down to the life of a progressive farmer. Guano fertilizer shipped to him on the railroad enabled him to reclaim what had been called a “howling waste.” Located north and east of the train stop is the site of the farm and outbuildings. Along the track once stood a telegraphoffice and a brick, Victorian stationhouse designed by E. Francis Baldwin, replaced with a wooden stationhouse which was demolished about 1954. A Plexiglas passenger shelter was placed here in 1996. The patterned tin former mill was built by Smith Hoyle, replacing his water-powered mill on Seneca Creek. Now the vistas open up to farmland. Glimpses of streams, ponds and woodland please the eye. Through the trees, you begin to see green fields, fences and horses. 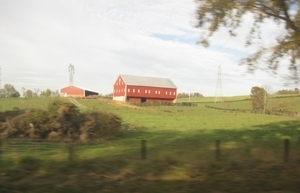 The Montgomery County Agricultural Preserve of 90,000 acres begins in Boyds and continues for nearly ten miles until the railroad crosses the Monocacy River into Frederick County. The Preserve is a cherished treasure and has received national acclaim. About the turn of the century Buck Lodge was a watering spot for summer vacationers who boarded in large Victorian houses near the railroad and north on Ten Mile Creek. A wooden train station and telegraph facility were demolished, but foundation remnants remain. A mile to the East of the present Barnesville Station was Sellman, a small community established in 1873 and named after its postmaster. By 1882 Sellman contained 50 residents, a number of dwellings, shops, and stores. Two houses, and remnants of the old 1873 station depot and two (former) stores still exist, but the main present use is a general contractor yard. As you cross over Rt. 109, the present Barnesville Station is on the left. 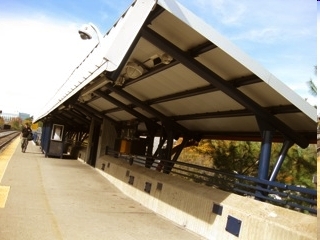 The original station was demolished in the late 1950s, and was replaced with this structure moved from Rockville in 1977, thanks to the efforts of local citizens. This unusual curved stone viaduct replaced a wooden trestle in 1906, when the line between Barnesville and Dickerson was realigned and double-tracked and is similar in size and design to the Seneca Viaduct. Look for the Little Monocacy Creek and the viaduct’s stone parapet about three minutes out of Barnesville (a half mile east of Dickerson). 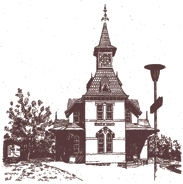 The two-story brick station planned for Dickerson was never built, and except for its triangular bay, the present station is a near replica of the one at Germantown, even to the 1891 date on the gable. When W.H. Dickerson started a store and post office near the railroad in1873, Mount Ephraim, several miles north, was the nearest settlement. 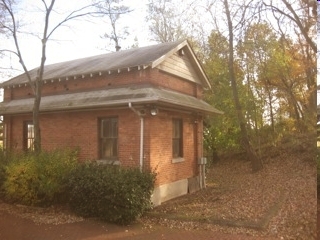 Dickerson was also the railroad agent for many years, and lived in a gray frame house still seen 200 yards north of the station. Like other rural stations, Dickerson had a milk loading platform where farmers brought their milk to ship on the 6:00am “milk train” to Washington. Ice cream came to the general store by rail from Frederick via Point of Rocks. Old timers recall a blizzard that stranded a passenger train east of Dickerson for nearly a week. The line now follows a long, steep grade down to the crossing of the Monocacy, a stretch associated with many railroad accidents in earlier days. This is the major engineering work of the Metropolitan Branch. The present bridge is a 700 foot steel superstructure laid on six piers, three original ones and three added about 1900, when the entire viaduct was raised and reinforced to withstand the burden of heavier trains and engines. 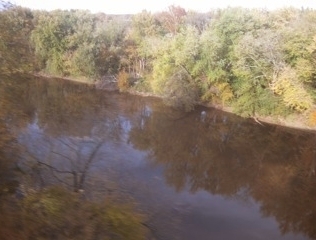 Look for the Monocacy River, and the famous C & O Canal “Monocacy Aqueduct” on the left 2000 feet down river. The aqueduct, completed in 1833, and parts of the viaduct piers, are made of white quartzite quarried near Sugar Loaf Mountain. Beyond the aqueduct is the Potomac River, while four miles east (on the right), rises Sugar Loaf Mountain. After major flood damage, the aqueduct has been restored completely and the stonework repaired. “Indian Flats,” a local name for the wide bottomlands north of the Monocacy, recalls ancient uses of the Potomac and Monocacy as canoe and hunting trails. It is a place of quiet beauty, beloved by local residents and enjoyed by bikers and hikers. For the last few miles into Point of Rocks the railroad runs alongside the old canal ditch, which is overgrown but visible even in summer. The canal abandoned commercial operations in 1924, unable to compete with the railroad. The canal and its towpath are part of the C&O Canal National Park, owned and maintained by the Park Service. Here the Metropolitan Branch meets the old Main Stem from Baltimore; known to several generations of railroad men and canallers as the “Washington Junction,” a transfer point between the canal and the railroad. The colorful Gothic revival station house, built in 1875 and listed on the National Register of Historic Places, is now the most outstanding station on the Metropolitan Branch. Designed by Francis Baldwin, this building was a duplicate of the one built in Boyds. The Point of Rocks quarries were the source of the “Potomac Marble” used for columns in the rotunda of the Capitol building. South of town are some of the oldest fords and crossings on the Potomac River, used by Indian bands and Revolutionary and Civil War soldiers. Indians from Piscataway in the lower Potomac were relocated at the Conoy Islands at Point of Rocks in the early 18th century where they found abundant fish. Before construction of the Metropolitan Branch, farmers and dairymen near Point of Rocks had three ways to ship produce to Washington: on the canal, which took a day or more; by horse and wagon; or on the B&O Main Stem, a circuitous 95 mile trip via Baltimore. After 1873, the distance was cut to 41 miles and the time to an hour and a half. Leaving Point of Rocks, you will pass through tunnels literally cut through the point of rocks jutting into the Potomac River. You will arrive in Brunswick at 3:08. Coming in you will see a pretty town with a white steepled church and plenty of green space. The stationhouse is attractive and dates to an earlier era of pleasing architecture. There are no eastbound trains until Monday morning at 5:38, so you will need to have a driver meet you here. A well kept campground is within walking distance, located between the C&O Canal and the Potomac River, Brunswick Family Campground, 301 834 8056. To reach it, walk away from the town, cross a wooden bridge and turn left on the towpath. Brunswick is a railroad town. It has an ambitious Railroad Museum, several interesting restaurants, a book store and antique shops. Since it’s Friday, make it the first Friday of the month when stores stay open late and there is often street entertainment. Try Beans in the Belfry for bluegrass music and good, country food. Beyond Brunswick, lie Harpers Ferry, Cumberland, and the coal fields and granaries of the west. To see the old hand drawn Trail Guide site maps for The Rail Trail (now out of date), please go here.